History of the Freedom Struggle is a live and self-narrating tale of dedication and selfless sacrifices. No one knows how many mothers lost their sons, how many women got widowed and how many spent their lives in prison cells and died there in the struggle to get their motherland freed from the clutches of slavery. Urdu writers too played active and leading role in this struggle. Pens became the swords and words banners of expression. The first name among those journalists who did not hesitate in sacrificing their lives for their country’s liberation by all means is that of Maulvi Muhammad Baqir, editor of Delhi Urdu Akhbar. Maulvi Muhammad Baqir came from a respectable and educated family of Delhi. His father Maulana Muhammad Akbar Ali was a known Shi’a scholar and a known Mujtahid of his time of Delhi. After finishing his religious education Maulvi Muhammad Baqir went to Delhi College for further education. After completion of his education he took up several jobs such as teaching at Delhi College and as a Tehseeldar in the Revenue Department but that was not his final goal. In 1836 when the Government, after amendment in the Press Act, allowed publication of newspapers, he entered the field of journalism that became his art and identity. In January 1837 Maulvi Muhammad Baqir launched weekly Delhi Akhbar. After Jam Jahan Numa of Calcutta this was the second Urdu language newspaper in the Indian sub-continent and first in north India. This newspaper survived for about 21 years during which its name was changed twice. On 3 May 1840 it was renamed as Delhi Urdu Akhbar while on 12 July 1857 Delhi Urdu Akhbar was renamed after the Mughal Emperor Bahadur Shah as Akhbar-al-Zafar. And then its ten last issues came out with this name. Delhi Urdu Akhbar is the pioneer and founder of National Urdu journalism. Maulvi Muhammad Baqir used and introduced modern technology in the newspaper and shaped it to meet and fulfil contemporary demands. He focussed on news creating interest and newsworthiness in headline and newswriting and classified the news items. The section for Court (government) news was headed as ‘Huzoor-e-Wala’ while [East India] Company’s news was carried under ‘Sahib-e-Kalan Bahadur’. In order to get latest news he had developed a network of authentic and reliable waqa-e-nigar [narrators or correspondents] who had access to higher authorities. Delhi Urdu Akhbar was the proclaimer of the feelings of the nation. That was the period when there was no political party in the country. In such an atmosphere the newspaper played vital and leading role in creating political awakening in the masses and uniting them against the foreign rulers. 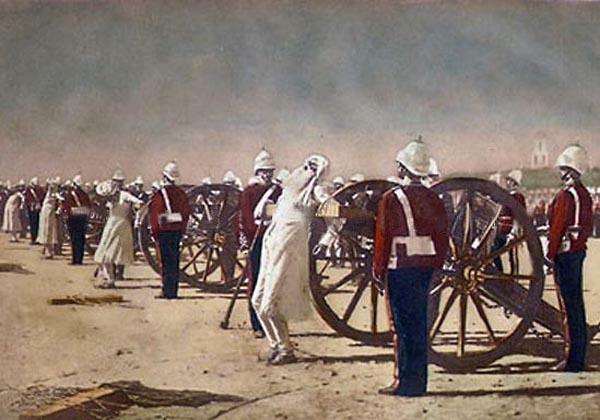 It ignited the love of freedom and gave the courage and confidence to rally against the British Raj. An official report of 1853 described it as a wide-mouthed and outrageous newspaper. Soon after the start of freedom struggle it became a freedom fighter itself. The fire of Freedom that got ignited in Meerut on 10 May 1857 helped Mujahideen [freedom fighters] reach Delhi by 11 May. 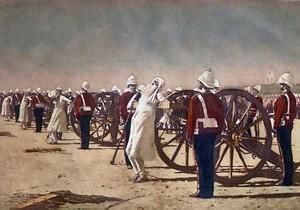 Following this started a series of events of the magnitude that shook the ground underneath the feet of the Britishers. Maulvi Muhammad Baqir responding to this call to freedom was busy doing jihad with his pen. In its report of 17 May 1857 Delhi Urdu Akhbar carried a detailed report of the advance of Mujahideen. Following is an excerpt from the report. ’11 May 57 AD, due to the summer weather court proceedings were being held in early morning. Saheb Magistrate was busy presiding in the court room… At about 7 am Bridge In charge came and informed, “Some Turk soldiers have gone on a violent spree and started beating us. They wanted to plunder the collected revenue. Under some pretexts I engaged them in chatting and ulocked the barrage so that they could not advance further. They have burnt down the Revenue office and Saheb’s Bungalow at Sleempur Road.” As Saheb became thoughtful for a while and then stood up and went to Col Magistrate who was holding a session in the adjoining room. After some ghitpit [chatting in English] he went to the Treasury Room and in consultation with the Treasury Officer secured the treasury and ordered the treasury guards to get ready. As per order they loaded their guns and stood in a stand by position. Security was also deployed at the Jungi Darvazah at Kachehri. It spread panic in the court room and its staff. Then with that information Magistrate Saheb went to the Commissioner. In the meanwhile rumours said that the Turk riders had gathered under the Jharonka of the Fort… A little later reports were heard that Qiladar, Bade Saheb, Dr Saheb and maim log [English ladies] had been killed at the gate and the riders had managed to enter the fort. His Lordship, wearing the ritual turban and an English sword also came to the court. In order to encourage freedom fighters Maulvi Baqar commended them strongly and persuaded the masses to cooperate with them and participate in their struggle. Such stimulating writings may be seen in several issues of Delhi Urdu Akhbar. ‘This gallantry of yours and the courage and zeal with which you have shattered the perversity of such a strong and arrogant empire and have humbled its Pharaoh like ego and Shaddad like pride will be remembered in channels of history…and you have relieved the masses of India from the unseen curse that had fallen upon them. Poorab ke tilangoN ne liya sab ko yahan maar. ‘Shopkeepers of the city have gone on a rampage of high handedness and are behaving in a very cruel manner. With regard to cereals and other essential items people are suffering as most of the commodities are not available and if available then they are very expensive. In every market only small number of shops remains open and what remain open they present the [proverbial] scene of customers as ek anar sau beemar [one pomegranate for one hundred patients]. Similarly cereals [sold] are rotten and other commodities are of inferior quality. But hunger is powerful and lacks mercy and desperation worsens the situation. Helpless customers have no choice and buy whatever is available thinking it a blessing. By the beginning of September 1857 when Mujahideen became weak and started facing defeats, somewhere along the lines Maulvi Muhammad Baqir also started losing heart. 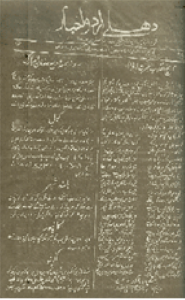 The issue of 13 September 1857 reflects this and this proved to be the last issue [of Delhi Urdu Akhbar]. Maulvi Muhammad Baqir was arrested for revolt and without being tried, on 16 September 1957 was tied to the mouth of a canon and was publicly blown up in front of the Khooni Darwaza. But this martyrdom strengthened the ongoing freedom struggle and sharpened the resolve of Mujahidana zeal of Urdu journalism. Contemporary publications and later newspapers and magazines followed the same national spirit and the mission to fight for liberation that had been set by Maulvi Muhammad Baqir. 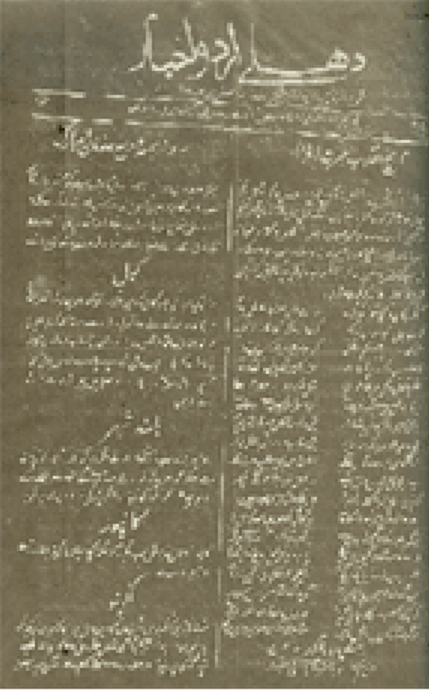 Delhi Urdu Akhbar was part of a mission. It was not launched for financial gains or fame and recognition. After paying for the expenses whatever return remained Maulvi Muhammad Baqir used to distribute it to help the poor. Its issues from January 1840 to September 1841 are available in the National Archive. In 1843 Maulana had also launched a religious magazine Mazhar-e-Haq that lasted until 1848.